The Redrock Micro microBalance Plus provides a vertical accessory plate for mounting microBalance counterbalance weights or other accessories to standard 15mm rods. It consists of rod clamp, left-right adjustment block and cheese plate. 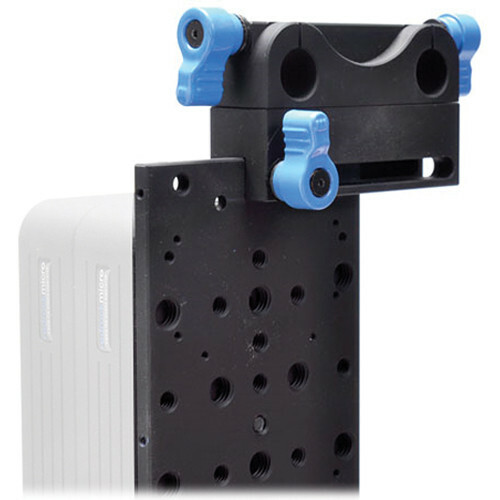 With the rod-clamp with thumb screws, you can securely attach the microBalance Plus unit to 15mm standard rods of camera support systems. Using the left-right adjustment block, you can optimally adjust the position of the counterweight to balance your camera system. The cheese plate offers mounting holes for Anton Bauer or Sony v-mount battery plates. MicroBalance Plus is rated 4.4 out of 5 by 7. Rated 5 out of 5 by benjamin c. from Micro Balence Plate The Micro Balance Plate is the most important accessory i think any serious/semi-serious videographer can own. i work with a Wireless Video and Wireless Audio all the time so having this piece is outstanding. i have adapted it with an Anton Bauer Battery plate on one side and Soft Side Velcro on the other for mounting the transmitters/receivers for my wireless equipment. (but of course you could put anything there, a Ki-Pro Mini, Magic box, converters what ever you name it. even if i don't need to add an Anton Bauer battery for power i sometimes add it anyway, so that the rig is more comfortable and back heavy during those long hand held scenarios. overall it is a bullet proof piece of steal and quick to make adjustments with. Rated 5 out of 5 by Anonymous from MicroBalance You get what you pay for, and in this case (as with most RR products) you get a top-notch vertical accessory plate that compliments any rig nicely. I have it fitted with an IDX v-mount adapter (P-V257) and counterbalance weights to help take the load off the front end of my shoulder rig. The plus in this case is a very useful ability to shift the center of weight to the left or right. Rated 3 out of 5 by Anonymous from Does the job OK but needs improvement I bought this to use with Vincent Laforet's Indie Filmmaker Rig that I got from B&H because the original package did not come with a cheeseplate. I needed it in order to pull the counterweight down behind my shoulder, rather than parallel to the ground as it originally was. Well the cheeseplate effectively holds down the counterweight, which was good, but unfortunately the mechanism by which the cheeseplate screws on to the piece that attaches to the two shoulder rods is not very good. The screw no longer fits properly into the threads (The screw first goes through a long hole and into a thread) and I'm afraid that at any moment it's going to fall off. Plus there's only one screw, so it's quite unstable. It's a good product, and necessary if you're going to use counterweight, it's just not very effectively designed. I recommend checking out some other companies to see if they have cheeseplates compatible with Redrock Micro gear before purchasing this one. Rated 5 out of 5 by Supasteve from I would definitely buy this agian The MicroBalance Plus is great. The Plus version allows ypou to shift the weight from side to side ( I used to have problems with this in the past. Also I would like to conclude that although I find all RedrockMicro stuff great but a little expensive. NBut if you can afford it buy it. Rated 5 out of 5 by Supasteve from Very Nice These weights are great. The thing that I like about them is the design. They are easy on easy off with a push of a button. is this built for standard 15mm rod set up pr light weight 15mm rods?